Either you loved or hated Nicki's attention-grabbing performance at the 54th annual Grammy Awards earlier this year. If you happen to be down with The Catholic League, you hated it. Nicki's five-minute performance of "Roman Holiday" and "Roman's Revenge," featured dancing priests and an on-stage exorcism. 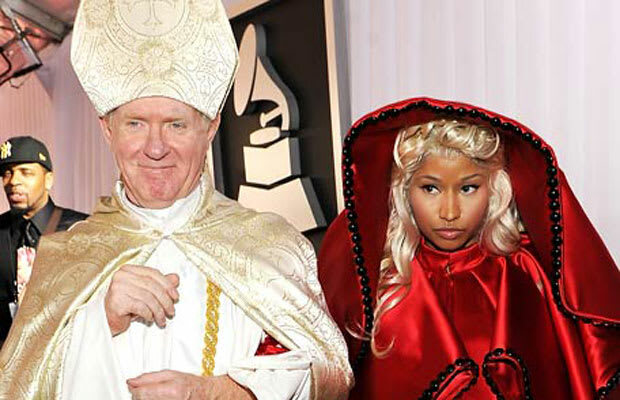 She even walked the red carpet with a fake pope. Nicki says she was inspired by the 1973 movie The Exorcist, but overall, the performance was a fail. The worst part? Nicki bending backwards while an altar boy prayed between her knees. We know Nicki likes the idea of possession but with all the reports of child-abuse in the church that was downright offensive.